There is an icon that hangs in the church's office that Father Walker left at St. Alban's. I've often looked at it and studied it - wondering what it represented. It shows three winged figures gathered at table around a chalice. I imagined it was an icon representing the Eucharist - until I did some research. It turns out that the icon represents the Trinity. The doctrine of the Trinity is the Church's ancient, wonderful and mysterious belief that we worship one God who is made known to us as Father (creator), Son (redeemer) and Holy Spirit (sanctifier). One God - not three. 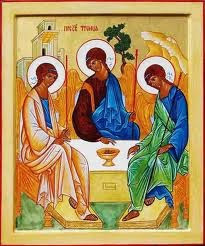 Three persons - or ways made manifest, yet one God. God is like a community! This belief - like our icon - is mysterious and strains our imagination. Come celebrate this mystery with us this Sunday, May 26, 2013, The First Sunday after Pentecost: Trinity Sunday at 8:30 a.m. and 10:30 a.m. with Holy Eucharist. Join us for Christian Education classes at 9:15 a.m. and stay for coffee and fellowship - we too are a community and there is nothing mysterious about that! Or is there?